We’d love your help. Let us know what’s wrong with this preview of TCP/IP Network Administration by Craig Hunt. TCP/IP Network Administration, 2nd Edition is a complete guide to setting up and running a TCP/IP network for administrators of networks of systems or users of home systems that access the Internet. 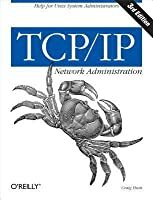 It starts with the fundamentals: what the protocols do and how they work, how addresses and routing are used to move data through the network, and how to set up your network co TCP/IP Network Administration, 2nd Edition is a complete guide to setting up and running a TCP/IP network for administrators of networks of systems or users of home systems that access the Internet. It starts with the fundamentals: what the protocols do and how they work, how addresses and routing are used to move data through the network, and how to set up your network connection. Beyond basic setup, this new second edition discusses advanced routing protocols (RIPv2, OSPF, and BGP) and the gated software package that implements them. It also provides a tutorial on how to configure important network services, including PPP, SLIP, sendmail, Domain Name Service (DNS), BOOTP and DHCP configuration servers, and some simple setups for NIS and NFS. There are also chapters on troubleshooting and security. In addition, this book is a command and syntax reference for several important packages, including pppd, dip, gated, named, dhcpd, and sendmail. To ask other readers questions about TCP/IP Network Administration, please sign up. As the author himself says: "If you really think of yourself as an “idiot” when it comes to Unix, this book is not for you. Likewise, if you are a network administration “genius,” this book is probably not suitable either. If you fall anywhere between these two extremes, however, you’ll find this book has a lot to offer." I am a computational scientist, therefore I am somewhere in the middle between the previously mentioned extremes. This book assumes that you have a good understanding of computer As the author himself says: "If you really think of yourself as an “idiot” when it comes to Unix, this book is not for you. Likewise, if you are a network administration “genius,” this book is probably not suitable either. If you fall anywhere between these two extremes, however, you’ll find this book has a lot to offer." This book assumes that you have a good understanding of computers and their operation and that you’re generally familiar with Unix system administration. Many concepts are ordinary knowledge both on everyday computing, and in the realm of duties of a computational scientist with technical duties and hand-on practice. The concepts are rigorously explained. There are exhaustive examples, accurate schemes, and useful figures. For me it will be a good reference. If you need some groundings for a collection of protocols used almost 24h/day in our current world, this is the right book to start with. My main takeaway from this book is that Sendmail configuration is totally crazy. Хорошее, но суховатое руководство. Плюс, несколько уже устарела. An old book going back to 1992 in the first edition. Still a must have reference book for anyone in Systems Administration, Networking, or management of Data Centers. compulsory reading to work on the internet. This is my syllabus book.